Through the eyes of art, he has seen the world of music and is concerned that many budding talents may never pass the larva-pupa stages. Lemi Ghariokwu is not a musician. The 61 year old says he knows more about being a musician than some actual singers. He has created over 2,000 album covers for world greats including: Bob Marley, Lucky Dube, Yvonne Chaka Chaka, Maryam Makeba and Mariah Carey to Nigerian greats - Fela Kuti, Shina Peters, Raskimono, Ortiz Wiliki, Majek Fashek and 2Face Idibia. He says there are only a handful of artistes who have weathered the musical storm and evolved with the times. 2Face Idibia has remained relevant for over 20 years in the music industry, from his days with Plantashun Boiz. Wizkid has gone global at the age of 27 with a career that dates to when he was just 11. The Star Boy Boss has performed under the moniker’ Lil Prinz’, and Fela’s son, Femi Kuti has been performing professionally since 1986 with his father’s band, Egypt 80, before launching his own band Positive Force. 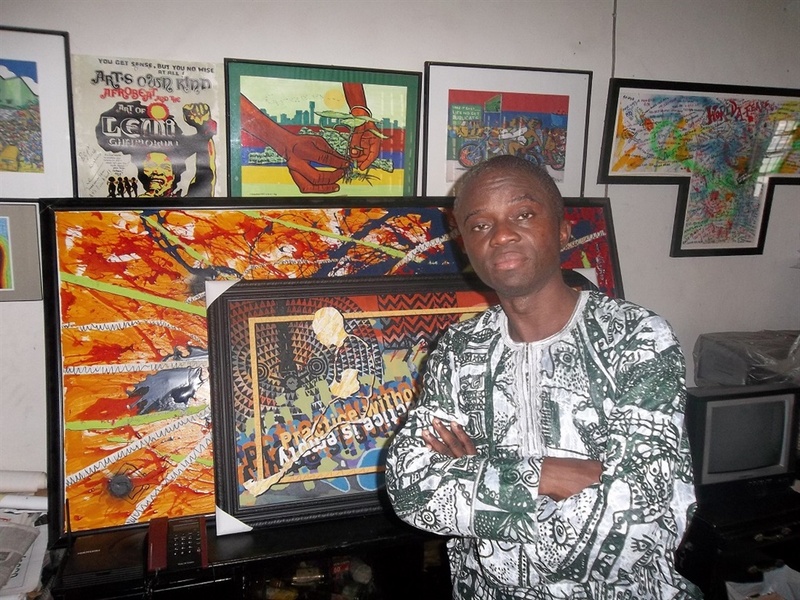 Bounce News had a chat Lemi Ghariokwu at the just concluded Art Fair In Lagos, ArtX. He shared this thoughts on how many musicians want to blow without putting the hard work or making sacrifices. "Fela has led by example, I got a lot from Fela. I got to know about the importance of hard work. This new generation of musicians need to learn about hard work because you cannot ‘blow’. You evolve. "If you blow, the same way you blew you will burst like a balloon. We need to learn hard work, it has taken me 43 years to get here, I have been doing album covers since 1974. "I have done over 2,000 covers. I did 26 for Fela, that is like 10%. That is my road to fame, anything we have in our hands to do, we do it to the best of our abilities, and all these things take time", he added. Even though he was not involved in making the songs, Lemi part was as crucial as the album itself. His art creates the first impression the would-be buyer of the album gets when he or she walks up to the shelve in search of good music. His task involves listening to and digesting the music and then reacting to what he heard through his paintings, design and comments. Lemi says he got Bruce Lee’s help to start his career in designing album covers, (Bruce Lee never knew this because they never met face to face). His journey to the top started in 1973, when as a young secondary school leaver, he spent his free time making portraits for people in his neighborhood. In 1974, he drew a portrait for "Enter the Dragon," starring Bruce Lee, (which was a big hit at the time) for a local bar. This caught the eye of a journalist named Babatunde Harrison who was a regular at the pub. While looking through Lemi’s drawings, he found one on Fela’s hit song ‘Roforofo Fight’. This spurred Harrison to connect Lemi to the Afrobeat legend. The socio-conscious artist says he is an advocate of Fela’s ideology of liberating Africa from mental slavery imposed by neo-colonialists through capitalism. "My sense of purpose is that ideology of preaching mental liberation of the African person. "I am a socio-conscious artist and I have a message to pass. We need to learn that in today’s society, look at the rulers of this country, they are not there with a sense of purpose, it’s just selfishness”. Through his music, Fela Kuti propagated that capitalism is the new way that foreign governments colonize African and Nigerian minds while corruption is simply an offspring of capitalists' wedlock. He spoke against corruption and 20 years after his death nothing has changed. 1. Former pension boss, Abdulrasheed Maina, who had been declared wanted by the EFCC and INTERPOL for committing $2.1 billion fraud while in office in 2013 found his was back into the Nigeria Civil Service, got promoted before he got sacked. 2. Recently the former Secretary to Government of Federation, Babachir Lawal was fired after he allegedly stole funds set aside rebuild the insurgency-ravaged North-East. Lemi feels hurt, "It’s still the same thing like Fela once said ‘Nah Old news be that’"
"Just the same way Fela’s music and Fela’s words are still relevant, same way my art speaks the truth, by translating Fela’s ideology, and it would be great if Nigerian artistes learn to make sacrifices. "Its not always about the money. Have a message and do something that always speak truth. "Everything he said is still happening till now, everything is playing back like in 3D slow motion. "It’s unfortunate that we refuse to learn from history, so we keep reliving history. So, all these things are still under one banner- corruption. "Tomorrow there will be another Maina gate and another Dizeani”, he said shaking his head slowly.